Last night, I was fortunate enough to make it out to the Barclays Center to witness the legendary E Street Band get inducted into the Rock and Roll Hall of Fame. It was a ceremony honoring a wide arrange of musicians: from Cat Stevens to KISS, from Hall and Oates to Nirvana. This eclectic group brought with them an equally diverse set of fans to Brooklyn; however, the loudest cheers of the night were easily in favor of the mighty E Street Band. From the start of the show, over two hours had passed, as several musicians were honored and performed their various hits. Like many award shows, the Rock and Roll Hall of Fame Induction Ceremony was plagued by long speeches in between the performances, and, after a medley of Linda Ronstadt songs, the energy in the arena was starting to fade. Then, at roughly 9:30PM, the video tribute to the E Street Band started to play, and the crowd jolted right back up. Bruce made a short speech honoring the band, summing up how each member joined, what their contributions were, and how each individual's presence made the entire group stronger. Bruce's speech was not marked with his trademark humor (save for a short aside about meeting Clarence); his words were marked with both pride, for the honor being bestowed on his friends, and regret, for the times he had let them down. 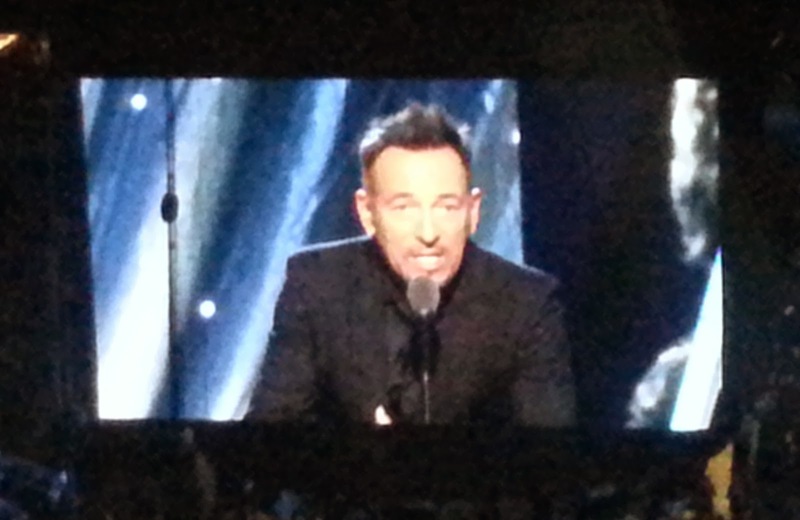 His main point was that a good band accomplishes things that no individual in the group could have accomplished alone, and the results clearly prove his point (Note: click here to read the entire transcript of Bruce's speech). 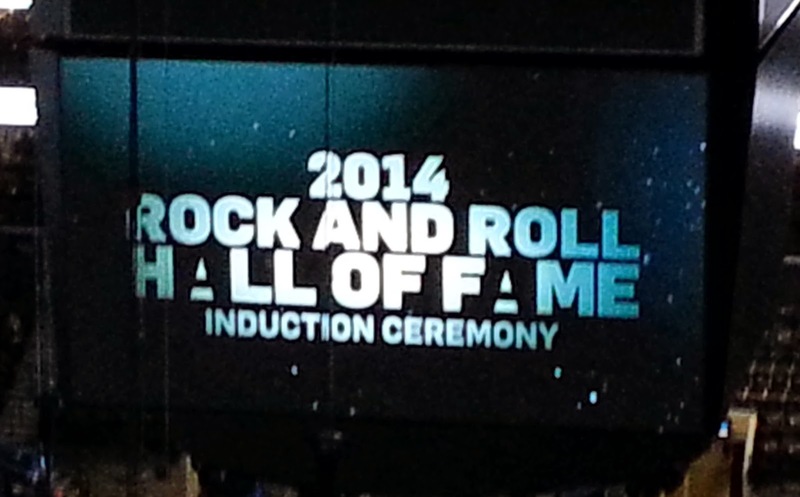 What followed were a series of acceptance speeches from all members being inducted: David Sancious, Vini Lopez, Garry Tallent, Roy Bittan, Nils Lofgren, Max Weinberg, Patti Scialfa, Steven Van Zandt, and family members honoring Danny Federici and Clarence Clemons (Federici's son and Clemons's most recent wife). While I believe all the members should get their moment to speak their mind, hearing 11 speeches in a row got tiring, as the audience was itching for the performance to begin. Perhaps the best strategy would have been to do a couple speeches, then play a song to break it up. Sancious, Lopez, and Clemons's wife were perhaps the longest, as they probably do not often get the chance to deliver a speech. Little Stevie kept his short and sweet, and was the most charming of them all (not only does he thank Bruce for getting ridiculously better each year, but he also thanks his wife for doing the same). The speeches conclude roughly 25-30 minutes after the beginning introduction, and it is finally showtime. The opening number is so obvious that I cannot believe I was surprised by it: "The E Street Shuffle". The band immediately gets into full swing, spotlighted by Vini Lopez and Max Weinberg smiling and playfully battling on the drums. The energy of the band is so strong that Bruce actually seemed exhausted after one song! It was followed up by "The River", which was an odd choice: it is more somber, and doesn't quite feature the E Street Band as much (in fact, the camera stayed mostly on Bruce's face throughout the performance). Personally, I think "Tenth Avenue Freeze Out" would have been better for the occasion. However, the band managed to top "The E Street Shuffle" with their final song: "Kitty's Back". Normally, when listening to the album versions, I'd prefer "E Street Shuffle", however, that night, "Kitty's Back" blew me away. I was highly impressed with David Sancious's organ playing, as this was the first time I'd seen him perform with the band. "Kitty's Back" ended up being perfect for the occasion. The band was proving Bruce's thesis, working together perfectly to create a fantastic moment. The set lasted roughly 20 minutes, and, with that, the E Street Band were officially Hall of Famers. They were immediately followed by Hall and Oates, who had technically difficulties when beginning their set, joking that Bruce has broken all the monitors. Given both the time constraints and the format, the E Street Band did a solid job this night, and hopefully won over some KISS fans in the process.